Lubricant formulations are constantly being modified and improved. This means it’s not always possible to have experience with new formulations in order to compare them with your in-service lubricants. While today’s formulations are designed to be superior to those developed 10 years ago, how can you confirm this? More importantly, what information is needed that will allow you to make comparisons between lubricants? 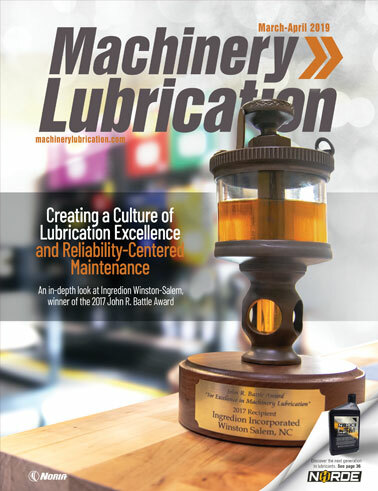 This article will describe industry-​accepted tests for predicting lubricant life, including results from real commercial lubricants. Many of these tests are used by formulators when designing and evaluating new lubricants. Comparing and analyzing these actual test results will reveal how to examine information from various resources and help you make better decisions about your lubricants. The lubricants in this study were turbine oils, which fall in the category of rust and oxidation (R&O) fluids. The samples tested included one polyalkylene glycol (PAG) oil and three different mineral oil formulations. 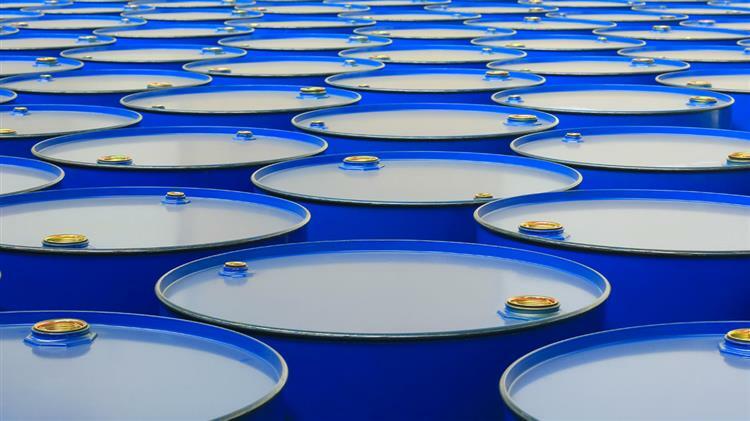 The mineral oil formulations were chosen from a list of commercial products based on the American Petroleum Institute’s Group II and II-Plus base stocks. They consisted of an older formulation, a new formulation and a new premium formulation. The PAG formulation was based on a Group V (synthetic) base stock. 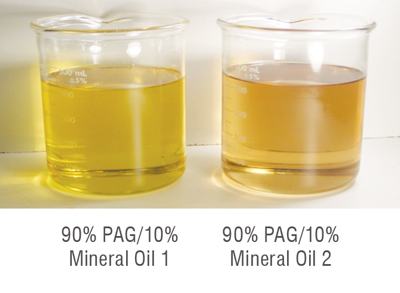 There are three types of synthetic PAG oils: water soluble, water insoluble and oil soluble. This study focused on water-insoluble PAG turbine oil. To complete the study, in-service lubricants were also obtained for these formulations if available. Since newer lubricant formulations may not have been in operation long enough for a comparable long-life measurement, bench aging tests are often used. The industry’s accepted aging tests include ASTM D2272, D2619 and D665(A). The lubricants in this study were aged by these standard test methods to assess their suitability for operation first as new lubricants. After the aging tests were performed, the lubricants were measured to determine their condition. The second group of analytical tests included ASTM D5185, D6304(C), D665(A), D974, D2272, D1401, D6971, D7414, D7843 and D892. The first consideration when changing lubricants is whether the new lubricant and the in-service lubricant are compatible. This issue can impact flushing and change-out decisions as well as result in significant costs. Group V synthetics are often thought to be incompatible with Group I-IV hydrocarbon fluids. This should be the first issue addressed, but it is also one of the easiest to answer. ASTM D7155 explains how to test fluids for compatibility. In this study, lubricant ratios of 90-to-10 and 95-to-5 were tested using two different Group II lubricants with the Group V PAG lubricant. These are the typical contamination levels observed during a lubricant exchange. Visual compatibility was the first phase of the compatibility testing. The lubricants were observed after they were blended and stored for three to five days. ASTM D7155 describes how to study samples and provides an appearance guide for rating compatibility. Are the lubricants clear and bright or do they appear cloudy? To meet the compatibility criteria, the blended lubricants must be “absolutely bright.” As seen in the photos on the right, the studied lubricants all passed the visual compatibility tests. If the two lubricants do not have good compatibility, three interactions are affected: liquid-air, measured by the lubricant’s foaming properties (ASTM D892); liquid-solid, measured by the formation of insoluble solids (ASTM D7843); and liquid-liquid, measured by the lubricant’s demulsibility (ASTM D1401). The change in the liquid-air interaction is measured using the ASTM D892 foam test. This measurement looks for a negative change in performance after the lubricants are blended. The test reports three values: the amount of foam at the end of the 5-minute blowing period (foaming tendency), the amount of foam at the end of the settling time (foam stability), and the settling time. Most new lubricants have a foaming tendency ranging from 10-60 milliliters and a foam stability of 0 milliliters. The test results for the blended fluids in the study (shown above) indicate that the lubricants passed the foam criteria for compatibility at this concentration. The formation of solids is a serious problem with lubricant compatibility. This is typically an additive issue in which one additive has poor solubility in the other lubricant’s base stock, or the additives in one lubricant react with the additives in the other lubricant. If severe, this can be observed in visual testing. However, the concentrations are often too low for observation. ASTM D7843, commonly referred to as the membrane patch colorimetry (MPC) test, can be used to observe solid formation. Results are reported as a dE value based on the CIE Lab scale. 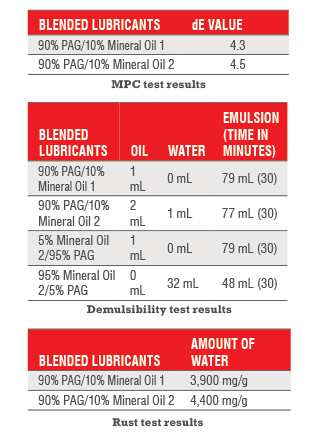 The MPC results for most new lubricants are in the 2-5 dE range. The test results for the blended fluids in the study (shown above) indicate that the lubricants passed the liquid-solid criteria for compatibility at this concentration. Demulsibility is the lubricant’s ability to separate from water. It is measured using ASTM D1401. This test blends 40 milliliters of water and oil, reporting the amount of oil, water and emulsion after a predetermined amount of time. According to ASTM D4304, a lubricant should have less than 3 milliliters of stable emulsion. The results for the blended fluids in the study are shown above and reveal that these lubricants failed the test. When water limits are exceeded, most condition monitoring programs alert users about the lubricant’s condition due to potential rust issues. Since the studied lubricants were R&O fluids, passing a rust test was a primary concern. visual rating of steel pins as shown above. ASTM D4378 defines water as critical at 200 milligrams per gram (mg/g) of lubricant. The synthetic PAG lubricant failed this test. Even when blended, the lubricant’s water levels still did not meet the recommended amount. The initial study evaluated the new lubricants (PAG, mineral oil 1 and mineral oil 2) and determined that they passed the rust criteria. The next step was to perform the tests with aged lubricants. For this, the lubricant was run to 75 percent to the end of a rotating pressure vessel oxidation test (RPVOT). This is based on ASTM D4378, which explains that a fluid is at its end of life when the RPVOT reaches 25 percent of the new fluid (75 percent to the end of the RPVOT). RPVOT adds excess water to the lubricant as part of the test, so water is already present to cause potential issues. The rust test (ASTM D665A) for the new and oxidation-tested lubricants showed passing results. The rust inhibitor in all three fluids was found to be sufficient to protect equipment even at high water levels. However, the synthetic PAG lubricant indicated some discoloration that could be of concern, but it was not defined visually as rust, so the sample passed. The hydrolytic stability of a lubricant is its ability to hold up to the ingress of water. Water can be a very reactive component to the lubricant’s additive system. Hydrolytically unstable hydraulic fluids form acidic and insoluble contaminants, which can cause system malfunctions due to corrosion, valve sticking or a change in lubricant viscosity. ASTM D2619 is the standard method for defining the hydrolytic stability of a lubricant. In this test, a lubricant is mixed with water and a copper test specimen, sealed in a pressure-type beverage bottle and rotated for 48 hours at 93 degrees C. At the end of the reaction time, the oil, water and sediment layers are separated for analysis. This test reveals the maximum weight change of copper and the maximum total acidity of the water layer. ASTM D2272 is one of the most popular tests for evaluating how lubricants behave during aging. This test method utilizes an oxygen-pressurized vessel to determine the oxidation stability of turbine oils in the presence of water and a copper catalyst coil at 150 degrees C. The number of minutes required to reach a specific drop in oxygen pressure is the oxidation stability of the test sample. With just a 50-gram sample, you have enough fluid to perform additional experiments. Two types of experiments were performed using the D2272 test. The first reacted the fluid until the defined end of test. The second reacted the fluid until the time reached 75 percent of the new fluid value (25 percent of the RPVOT time remaining). Once the fluids have oxidized, their condition can be assessed with additional tests. ASTM D7843 is the industry standard for testing the varnish potential of in-​service lubricants. All four tested lubricants exhibited similar failing varnish values at the end of the RPVOT test. Even the MPC patches showed the lubricants were in a failing condition. 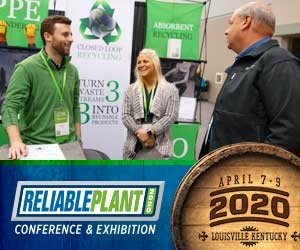 According to ASTM D4378, you should consider replacing an in-service lubricant when the RPVOT results reach 25 percent of the new lubricant values. Therefore, the new lubricants were tested until they reached 75 percent of the new lubricant value (or 25 percent of the RPVOT time remaining). MPC values for these oxidation samples were then obtained. Again, the MPC patches showed the lubricants were in a failing condition. The results of this test indicated lower than expected varnish levels. However, the levels were still considered critical, so it was recommended to change all four lubricants at or before 25 percent of the new oil’s RPVOT value. The varnish formation of both the mineral oils and the synthetic PAG lubricants showed similar varnish levels at the recommended change value (25 percent of the new lubricant value). It should be noted that the RPVOT life of the new mineral oil lubricants was more than 1,000 minutes, while the PAG lubricant was measured at 657 minutes. When the test for the PAG lubricant was extended to 1,000 minutes, the MPC for the fluid was measured to be 72.3 dE, which was still in the same range of the previous results. However, the viscosity was very high, making the MPC measurement difficult. In this case, the viscosity would be the most important value, as opposed to varnish. Acid number, as defined by ASTM D974, has often been described as the criteria for a lubricant’s end of life. For years, this was the condemnation standard for mineral oils. ASTM D4378 recommends a warning level of 0.3-0.4 milligrams of potassium hydroxide (KOH) per gram increase over the new oil’s acid number. PAG lubricants have a suggested limit of 5 mg KOH/g. 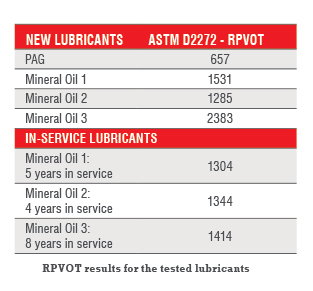 At 75 to 100 percent of the end of the RPVOT test, all three lubricants had an acid number in the range suggested by ASTM D4378 as the end of the fluid’s life. The high acid number in these results might also explain the rust observed in the ASTM D665 test for the PAG lubricant. Elemental analysis is a test that isn’t generally studied in relation to RPVOT. RPVOT uses a copper metal catalyst coil in the fluid. If the copper dissolves into the lubricant, it acts as an oxidation catalyst and could accelerate the test. If copper corrosion poses a potential problem at the end of the ASTM D2272 test, it should be seen in the elemental analysis as an increase in copper. The copper sensitivity found in the hydrolytic stability test for the PAG lubricant was again detected in this test. It was observed at a higher level due to the higher oxidation of the lubricants. This offers some distinguishing parameters for comparing the lubricants. Oxidation is often studied in relation to the quantity of antioxidant remaining in the lubricant. This parameter is measured using the Remaining Useful Life Evaluation Routine (RULER) test (ASTM D6971). ASTM D4378 suggests a warning limit of less than 25 percent of the new lubricant’s antioxidant level. 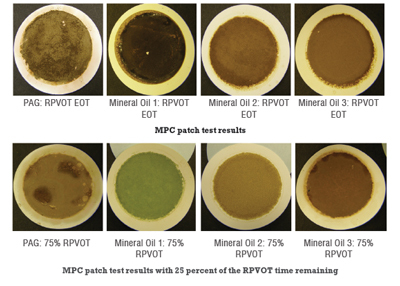 Based on the test results shown, it was recommended to change the lubricant at 75 percent of the end of the RPVOT time (25 percent of the new oil’s value) for both the PAG and mineral oil examples. Now the question becomes what do you see in the field. Is the field behavior of the lubricants the same as the bench oxidation tests? Field samples are difficult to obtain for many reasons, not the least of which is the time required to generate them. In examining the data below, you can see the same trends in the field as in the bench testing of the lubricants. This should provide confidence in bench testing and allow for rational conclusions about the lubricants being studied. What should you do about lubricant replacement? Do you put the same lubricant back in again? What if the lubricant has been changed and no longer exists? 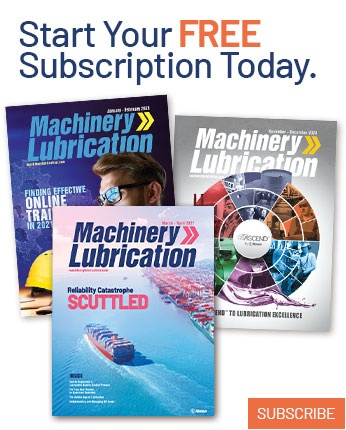 Do you rely on the new lubricant’s promotional materials? Do you rely on the experiences of your colleagues? Should you obtain your own performance testing data? Answers to these questions will be valuable in your decision-making process. When evaluating new lubricants, it can be difficult to determine whether the information being advertised by manufacturers is valid. A better approach is to utilize these standard performance tests that have been used successfully in the industry for years. They can enable you to make better business decisions and help optimize your lubrication program.